Parisian Muslims can now enjoy halal meals in an atmosphere that mimics US fast-food joints after BKM, or Beurger King Muslim, opened its doors. BKM has set up in the northern Paris suburb of Clichy-sous-Bois, where many locals are first or second generation Muslims from former French colonies. And half of the suburb's population of 28,000 are aged under 25, the Agence France Presse news agency reported. 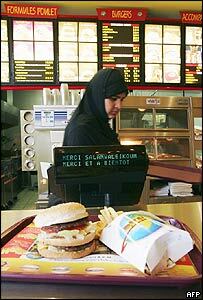 Beur is slang for a second generation North African living in France. As well as providing locals with specialities such as Bakon Halal and Double Koull Cheese - all of which are prepared to Islamic halal requirements - BKM has given the local economy a welcome boost. Project manager Mourad Benhamid told AFP that BKM had provided 28 new jobs in an area where one in four people of working age are unemployed. For most of BKM's employees, the restaurant had "ended a long period of unemployment", Mr Benhamid said. One BKM worker called Hakim explained that "young people in these suburbs have trouble finding work and this restaurant will allow the hiring of young people who have no diplomas or are looking for apartments". BKM has only one outlet so far. Inside, the decor is colourful, with boxed menus and a play area at the back, AFP reported. According to customer Leila Bekhti, BKM can help change people's attitudes to each other. "Muslims have a very negative image with what's happening in the world," she told AFP. "This place can be a meeting place for youth, and that's good." BKM's Mr Benhamid echoed that sentiment by saying "this restaurant is open to everyone". Middle Eastern-style kebab cafes are common in Paris, but BKM's food and decor aims to bridge cultural and generational divides.